This video explains why natural gas is more efficient and economical than using oil. People have been relying on oil-fired furnaces, boilers and water heaters for many years. However, a growing number of homeowners are choosing to replace oil-burning equipment with new heating equipment that burns natural gas. There are several benefits to converting your oil furnace, boiler or water heater into a gas-fueled system. Precision Air can help you make this switch so you can start saving on energy costs today! Call us today at 1-844-386-0719 or contact us online to get started with a free estimate in Nashville, Franklin, Murfreesboro and the nearby areas. What's motivating this switch? The main factors driving oil-to-gas conversion are explained below. Energy savings and protection from volatile oil prices. Natural gas prices are lower than oil prices, and most energy experts agree that this trend will continue. Oil prices are frequently affected by political unrest and natural disasters around the world. A single event can cause a dramatic increase in the price of oil. The price of natural gas is more stable. Upgrading to more efficient equipment. An older oil burner is likely to be operating at just 70%-80% efficiency, even when it's in perfect condition. In contrast, a new sealed-combustion gas furnace or boiler can operate above 90% efficiency. Replacing an older oil furnace or boiler with an advanced, super-efficient gas burner will yield major energy savings. Reducing greenhouse gas emissions. Natural gas burns cleaner than fuel oil. Switching from oil to gas means that you'll be aiding the environment by reducing air pollution and greenhouse gas emissions. Reducing dependence on foreign suppliers. Thanks to advanced extraction technology, an abundance of natural gas is being produced right here in the U.S. In fact, over 90% of our natural gas is domestically produced. Buying "American-made" fuel rather than foreign oil is a win-win: You save money and support job growth at home. Making the switch from oil to gas can cost anywhere from $4500 to over $10,000. There are several reasons for this wide price range. First of all, the cost of bringing a gas line to the house can vary greatly depending on where you live and where the nearest existing line is located. Secondly, it may be necessary to remove the oil tank that is no longer needed. A third factor determining conversion cost is the equipment replacement option you choose. Sometimes it's possible to simply replace the burner assembly in a furnace or boiler. In other cases, you'll have to remove the entire furnace or boiler and replace it with a new gas-burning appliance. As your local heating and cooling professionals, Precision Air will inspect your heating system and provide free estimates for any oil-to-gas conversion. If you're interested in upgrading your home's heating system, call us today at 1-844-386-0719 or contact us online to get started. 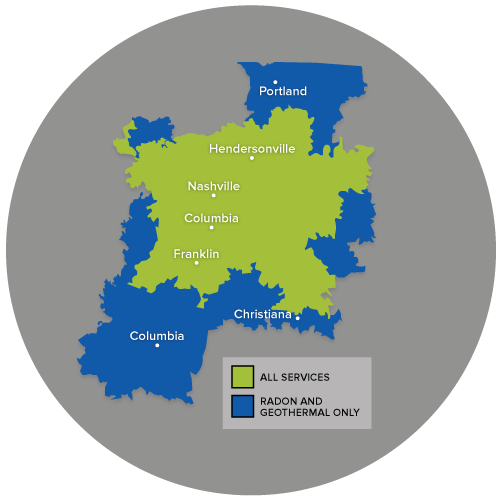 We offer all our services in Nashville, Franklin, Murfreesboro, Antioch, Hendersonville, Brentwood, Smyrna, Lascassas, Madison, Hermitage and the nearby areas.